When people think of going green, they often imagine reusing bags at the grocery store, buying local produce and carpooling with their neighbors. They foresee small, day-by-day actions compounding to create a more sustainable lifestyle and a healthier earth. Sometimes, however, the biggest changes are actually the most straightforward. Many Americans today simply buy electricity from their local provider, under the assumption that there are no desirable alternatives. This energy comes from a dirty source, releasing pollutants into the air and harming the earth. Especially for those of us who not only have our own health to worry about, but also our children’s, it is incredibly important that we join the movement to make a change. What most people don’t know is that the greener route is actually the easiest and the most lucrative. 70% of Americans are interested in going solar but only 1% of Americans actually have it. Why is that? The biggest misconception is that solar panels are expensive, and, despite their positive environmental impacts, they are only affordable for a small subset of Americans. 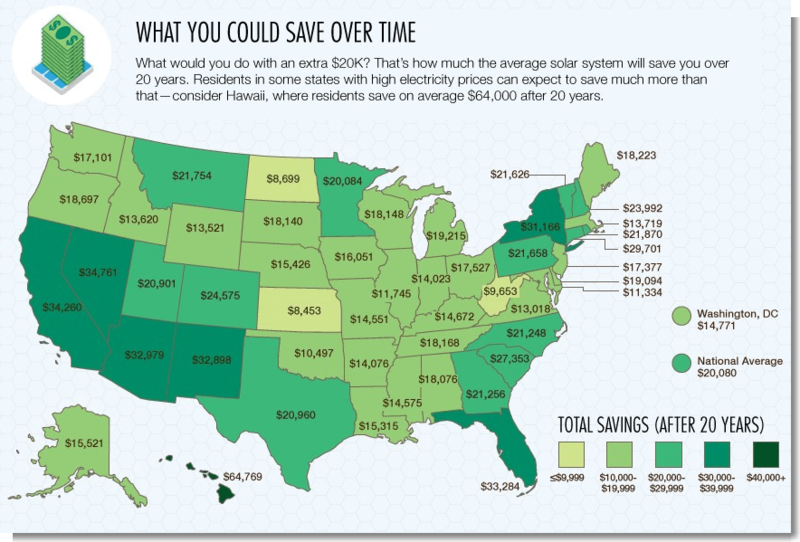 The opposite is actually true; depending on which state you live in, going solar can save you $20,000 in 20 years. Furthermore, there is no upfront cost, as you don’t have to pay for the solar panels or the installation. If you sign up with Clarus Power, you can switch to solar for no cost at all. Many people also worry that solar power will not effectively power their home, because they live in a place with cold winters or little sun. In reality, solar panels work well even on cloudy days. Just think of California: people have happily gone solar both in sunny Los Angeles and foggy San Francisco! Finally, individuals are wary of installing a new system that could be complicated to set up and a hassle to maintain. However, going solar with Clarus Power could not be easier. The solar panels will be set up for you in just one day. They require no maintenance and are resilient through harsh winters or storms. An average warranty is about 20-30 years long; By that time, you will have saved about $20,000– enough to pay for almost two years of tuition at some state colleges– and will have offset about 178 tons of carbon dioxide– the equivalent of planting 10 football fields worth of trees. For those of you who are incredibly excited about the prospect of going green and saving money in the process, there is a way to put more of your soul in solar. We provide training for individuals to become Clarus Power ambassadors. These ambassadors are paid help to spread the word about solar to those in their community and beyond. For more information on this program, contact addie@claruspower.com. With already one million Americans going solar, we are excited about how quickly the movement has grown. Join us in our efforts to save the planet– and your pockets– for yourselves and your children!